Land crabs are terrestrial crabs who live the majority of their lives on land. Unlike their red crustacean cousin, the lobster, land crabs can range in color from dark blue, in the case of the blue land crab, to the red, orange and black blackback land crab. Just as their coloring spans a rainbow, land crabs are found in a variety of locations and habitats. Gecarcinidae, the family of crabs adapted to live on land, inhabit tropical areas throughout the world. A widely distributed and diverse family of crustaceans, eight distinct species of land crab live in the Americas alone. Oceanic land crabs occupy nearly all tropical islands on earth. 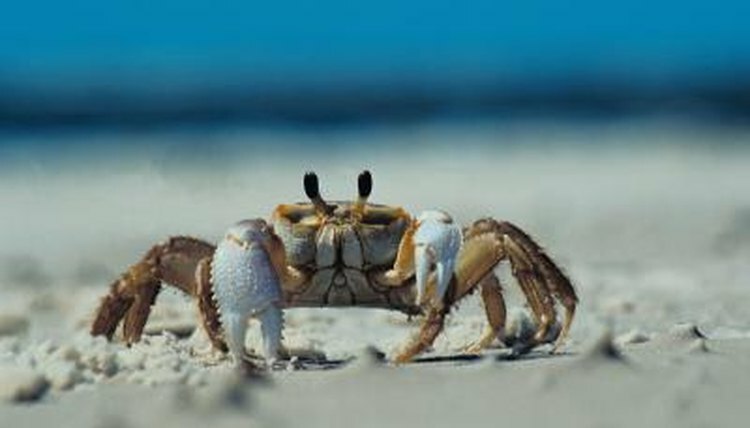 In the United States, the majority of land crabs are spotted in Florida and Hawaii, as well as the Eastern Atlantic coastline as they prefer brackish or saltwater shores near the sea. The Blue land crab, commonly referred to as the giant land crab, inhabits the coastlines of Bermuda, the Caribbean Islands, Texas and southern Florida. They rarely are found more than five miles from the shoreline, though some homeowners in low-lying, coastal areas have been known to encounter a blue crab or two in their living rooms. Though they spend a large portion of their lives on land, land crabs return to the ocean to breed, releasing their eggs into shallow waters. A land crab’s burrow is her sanctuary. Land crabs live in sand or soil burrows up to several feet deep. These burrows are close enough to the ocean to allow water to seep in for moisture, yet deep enough to protect them from any predators or the accidental human foot. Mangroves, marshes and, of course, the oceanic coastline are prime real estate for land crab burrows. Land crab diets vary slightly from species to species, but generally include nesting sea birds, invertebrates and plants. Tender leaves, fruits, berries, flowers, beetles and other large insects are the blue land crab’s preferred diet, while the blackback land crab occasionally enjoys animal matter found near the burrows. Land crab diets are limited to the plants and animals near their burrows. They typically do not stray far from the burrow when foraging for food.